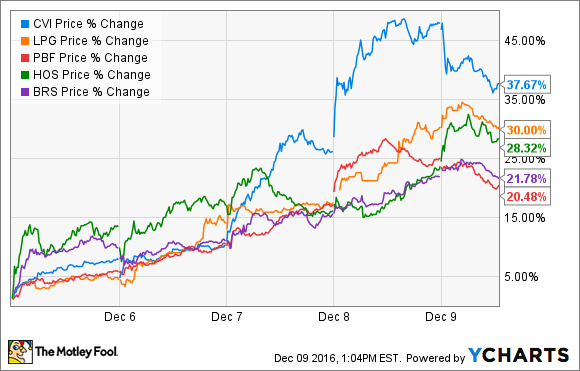 CVR Energy, Dorian LPG, Hornbeck Offshore Services, PBF Energy, and Bristow Group were up by double digits this week in hopes that help is on the way thanks to the president-elect and OPEC. CVI Price data by YCharts. Shares of independent U.S. refiners CVR Energy and PBF Energy have been red hot since Trump's election, up 80% and 32%, respectively, since Nov. 8. Fueling that rally was Trump's pledge to pull back regulations that have been hurting American businesses, including Environmental Protection Agency regulations that have decimated independent U.S. refiners. He took the first step in that process this week by nominating Oklahoma Attorney General Scott Pruitt to be the new head of the EPA. CVR Energy, in particular, has railed against the agency's policies, with the CEO of its refining arm saying that it is destroying small refiners with the Renewable Standards Program. The Trump administration, with Pruitt at the helm of the EPA, will likely dramatically overhaul that program, which could lead to improved profitability for independent refiners. Meanwhile, continued OPEC-fueled enthusiasm drove the stocks of Hornbeck Offshore Services, Bristow Group, and Dorian LPG up this week. Those moves are a continuation of their sharp rallies since OPEC agreed to step in to support oil prices at the end of November, with Hornbeck, for example, now up more than 80%. Investors see OPEC's decision as a game changer for offshore companies because it might push oil prices high enough to boost offshore drilling activities, which could mean more work for Bristow's helicopters and Hornbeck's service vessels. Meanwhile, improving oil prices should lift propane prices, which could continue to drive a rebound in seaborne LPG trade and lead to stronger demand for Dorian's vessels. There was one common theme running through all five of these upward moves this week: hope. Investors hope that Trump's new EPA head will cut the regulatory burden that has been holding back profits at independent refiners CVR Energy and PBR Energy. Likewise, investors see the OPEC deal fueling higher activity levels offshore, which could lead to more work for Hornbeck and Bristow, as well as driving demand for petroleum product vessels. While these outcomes might happen, investors need to be aware of the risk that these new policies might not lead to higher profits as quickly as the market seems to be pricing in.